Hidden Fence brand offers The DogWatch Hidden Fence dog Containment System. Only Hidden Fence uses a Patented “Safelink FM/DM digital signal” that’s transmitted through a tough polyethylene coated copper boundary wire installed around your property, below ground level or on a fence line. A lightweight, waterproof dog fence receiver collar worn by your pet picks up this harmless signal. When your pet gets close to the desired boundary (usually within 1/4 to 2 meters of the wire), an audible warning tone reminds your pet not to cross the boundary. If the warning is ignored, which is rare after training, the collar emits a customised stimulation (electrical stimulation or ES ) and prevents your pet from crossing. After the hidden dog fence is installed, the dog is then introduced to the dog fencing system. 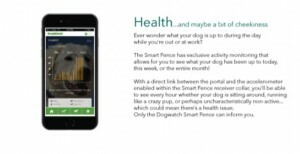 Through operant conditioning principles and clear instruction, your dog becomes well aware of the location of his new boundary fence, and receives reward when he avoids it. Hidden Fence will even train highly prey driven dogs using various target sources throughout the dog training if needed. Our dog containment systems are the only electronic dog fence available with UL Approved Internal and External lightning and surge protection. 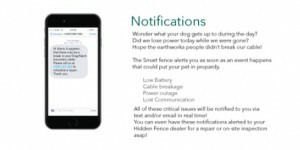 The Safelink FM/DM signal also provides industry leading reception from the transmitter to the receiver collar, the exceptional reaction time of 1/8th of a second Maximises the understanding your pet will recognise its boundary when approaching. Hidden Fence receivers have the fastest and most accurate reception in the industry. Hidden Fence offers the only internationally supported professional grade system available in Australia. Hidden Fence PT4 Dog Containment Fencing systems have a Lifetime Equipment Replacement Warranty! As with the PT4 containment system, the latest PT5 systems come with more! 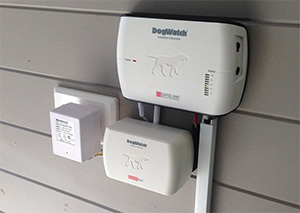 Internet connectivity enables you to monitor the security of the containment system, and includes as much detail as monitoring your pets activity – or lack of in some cases. Notifications are available by accessing the Web App via (smart phone, tablet or PC) or Text/Email notification!! Click here to get in touch with Joe to discuss your options now.